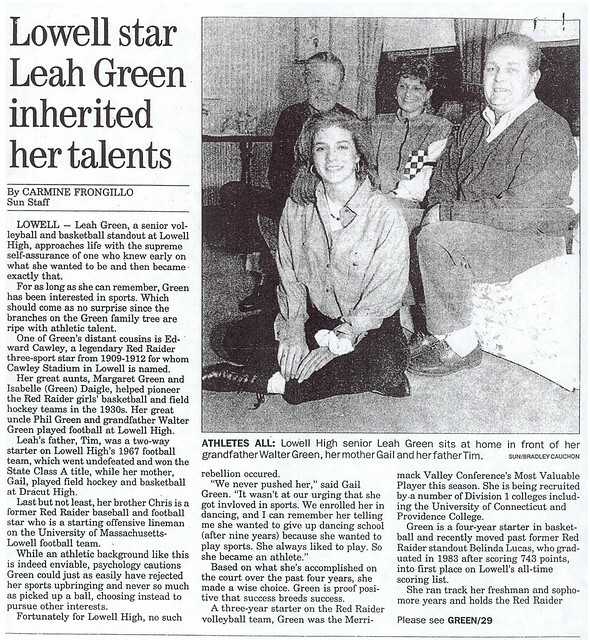 One of the premier athletes of the 1990’s at Lowell High School, Leah Green becomes the 3rd member of her family to gain induction into the Lowell High School Athletic Hall of Fame. A true 3-sport standout, Leah earned local, state, and New England honors as a member of the Red and Gray volleyball, basketball, and track teams. 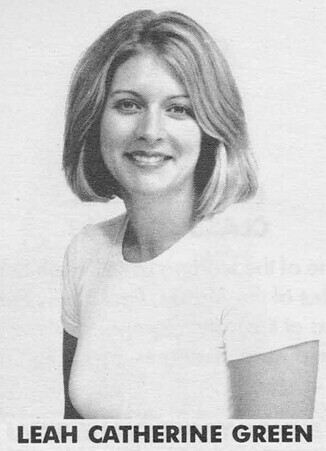 A key member of the Raider Volleyball team, Leah earned both MVC and Lowell Sun 2nd team honors as a sophomore (1991). 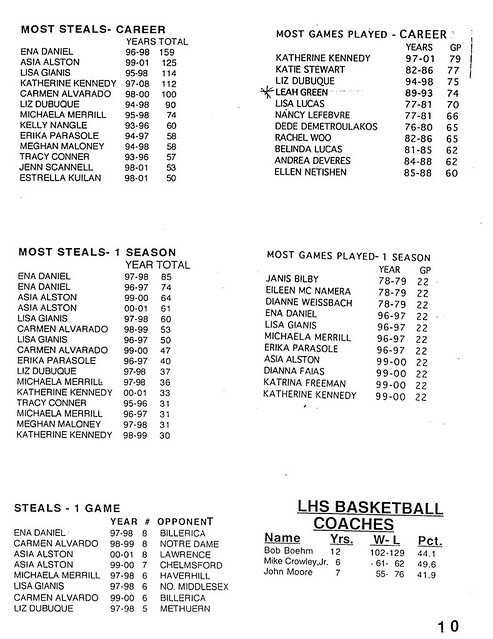 As both a junior (1992) and a senior (1993) Leah was selected to both the MVC All-Conference Team and the Lowell Sun All-Star Team. 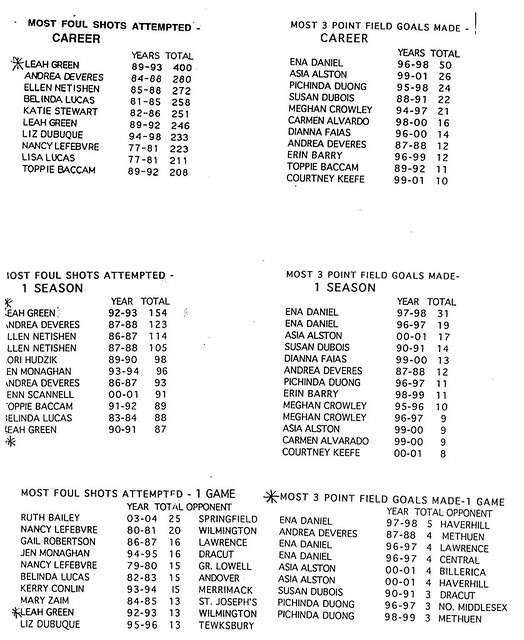 She was also named as the MVC’s Most Valuable Player and the Sun’s Player-of-the-Year for the 1993 season. 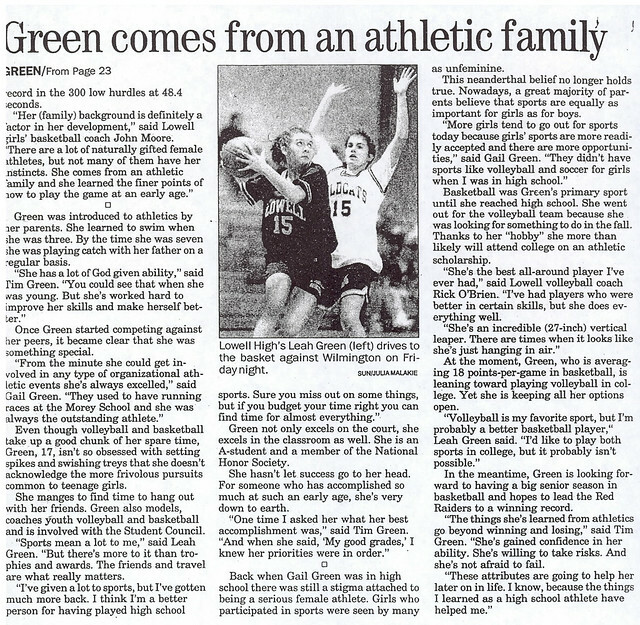 Leah culminated her senior season by being selected to both the Boston Globe and the Boston Herald All-Scholastic Volleyball Teams, as well as being a 1st team selection for the All-New England Volleyball Team. As a 4-year starter for the Lowell High Basketball team, Leah etched herself indelibly into the Red and Gray record book in a career that marks her as one of the most versatile hoopsters in the school’s history. 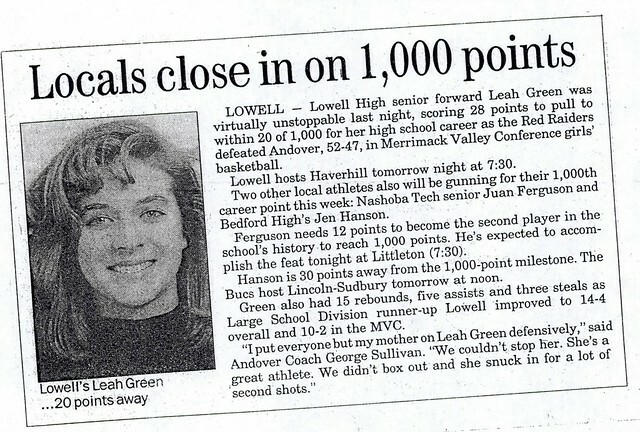 After scoring 246 points and gaining Lowell Sun All-Star honors during her sophomore season (1990–1991), Leah was named as the Sun’s Player-of-the Year in both her junior (1991–1992} and senior (1992–1993} years. Additionally, Leah was selected to the MVC’s All Conference Team as a junior and as the league’s Player-of-the-Year as a senior. 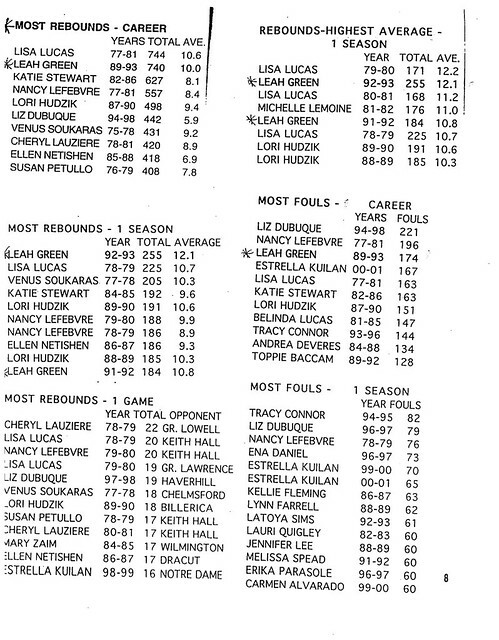 Leah’s senior season was perhaps the greatest in Raider history. Leah set school records in points (380), rebounds (255), points in a game (33), and foul shots attempted (154) while leading the Red and Gray into the State Tournament. 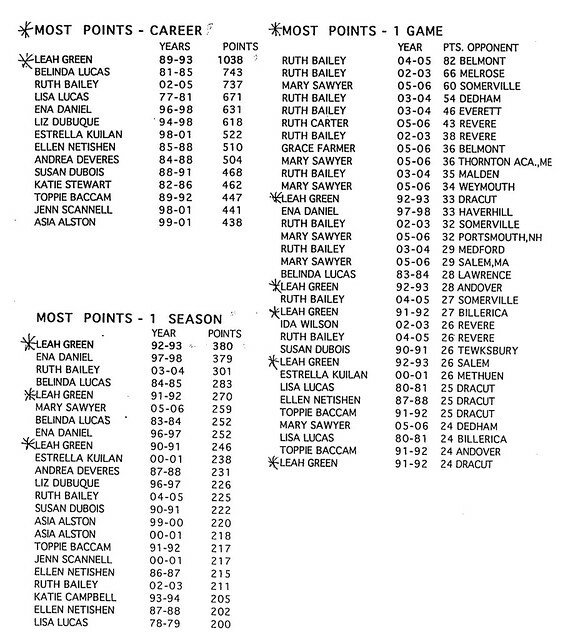 Leah’s name can be found in numerous other categories in the Raider record book, including career points (1038–the only female Lowell Hoopster to score 1000 career points). As a member of the Lowell High Track team, Leah set a school record in the 300-meter hurdles. She finished 4th in that event in the Eastern Mass Class A Championship (1991). She also was a member of the Red and Gray 4×100 meter relay team that placed 4th in the Class A meet. 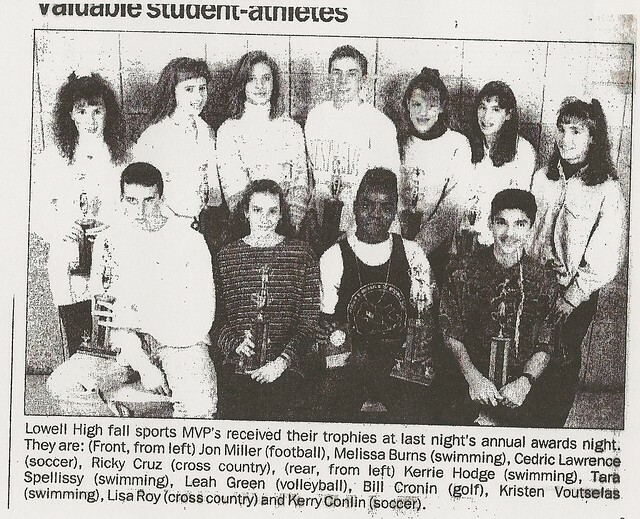 Leah was the recipient of the John Beaulieu Athletic Valedictory Award in 1993. Leah attended Iona College in New Rochelle, NY, on a volleyball scholarship. 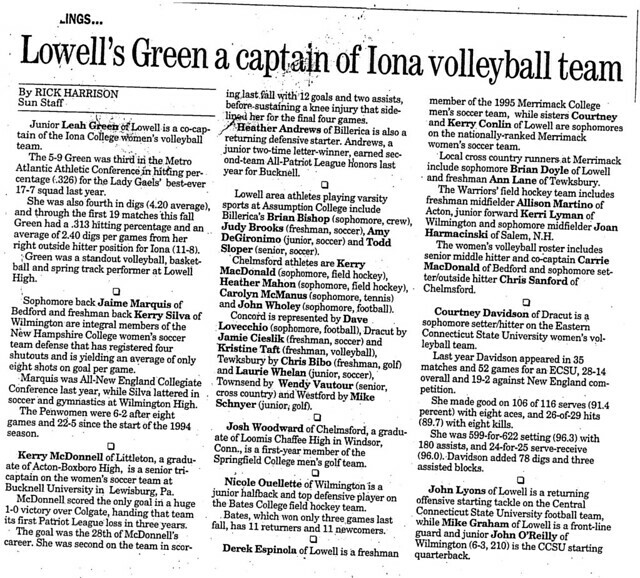 Continuing her athletic exploits, Leah captained the lona’s Volleyball team during her junior and senior seasons. She was a 3-year member of the Metro Atlantic Athletic Conference All-Academic team and a MAAC All-Tournament Player in Volleyball and All-Conference selection in Water Polo in 1996. Leah culminated her college career by being chosen as the recipient of the Joseph O’Connell Award as the Outstanding Student-Athlete, lona College in 1997. Leah joins her father Timothy Green (LHS ’67) and her brother Christopher Green (LHS ’89) in the Lowell High School Athletic Hall of Fame. The trio becomes the first father-son, father-daughter, and sister-brother pairs!